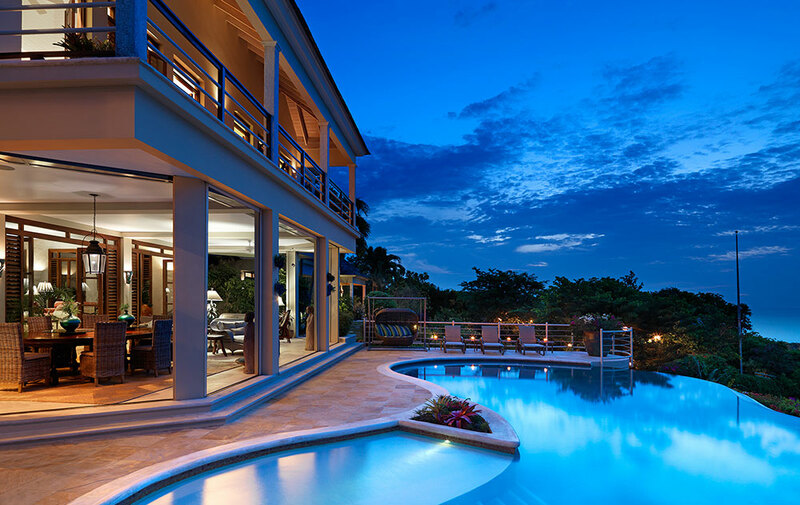 One of Jamaica's most stunning and luxurious homes! Stunning ocean views. Amazing infinity pool! ** Complimentary van and driver for bookings over 5 nights at the 5 or 6 or 7 bedroom level! ** 3 GOLF Courses!!! Complimentary green fees at CINNAMON HILL and WHITE WITCH Rose Hall Golf Course both 18 hole championship golf courses just 5 minutes away by car. ** MORE GOLF! Complimentary Half Moon Golf, Golf Membership Benefits, unlimited free green fees, unlimited use of practice facilities and range balls, 25% discount on optional cart rental, 25% discount on goods at Half Moon golf pro shop, 25% discount on instructional services at Half Moon Golf Academy, 25% discount at 19th Hole Bar. ** Complimentary Half Moon Resort Membership: Benefits include Sunrise Beach, Jacuzzi, tennis courts, fitness center, Croquet and miniature putting green, The following activities may be booked on the day of service and are subject to availability: Spa, Horseback Riding, Water sports, Dolphin Lagoon and Tennis. alf Moon golf course to the East of Montego Bay. 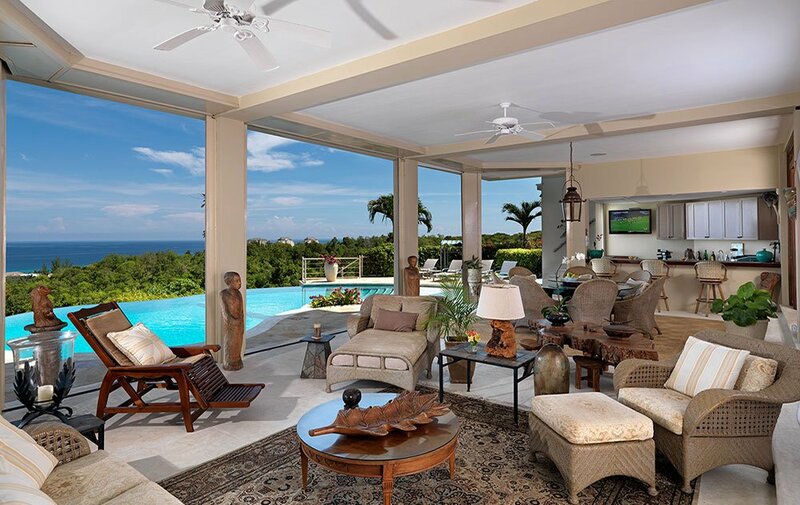 This spectacular modern villa uses the best of traditional Caribbean style to create a grand yet very comfortable vacation home with stunning 180 degree Caribbean seaviews. **Greatview comes with membership at Half Moon Hotel, only a 5 minute drive or a short walk from the villa. 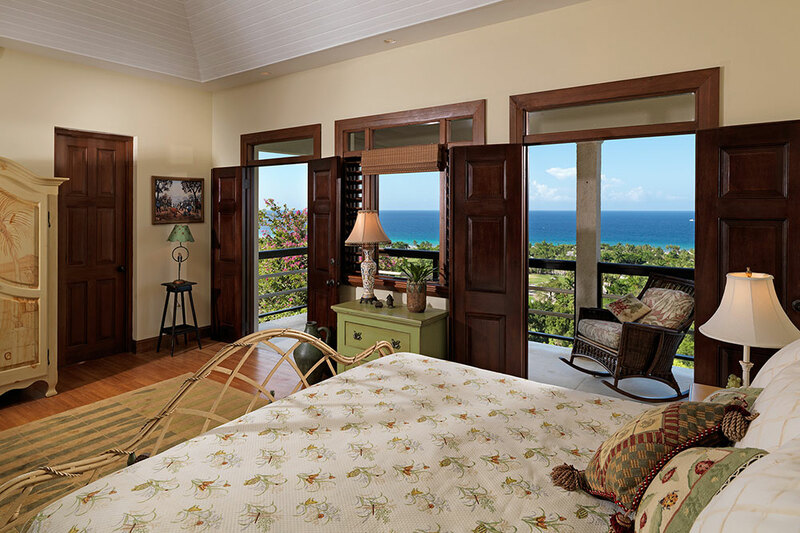 Half Moon is situated on 400 acres that are ribbonned by a two mile long white sand beach. Guests have access to the Sunrise Beach, pools, tennis courts, fitness center and Half Moon’s 18 hole signature golf course.Golf course membership entitles guests to unlimited green fees, the use of practice facilities, and 25% discount on cart rental, goods at Half Moon’s pro shop and instructional services at the Golf Academy. Located in the most exclusive Spring Farm Estate, Greatview is one of the most luxurious private homes accessed only through a private guarded and gated community. 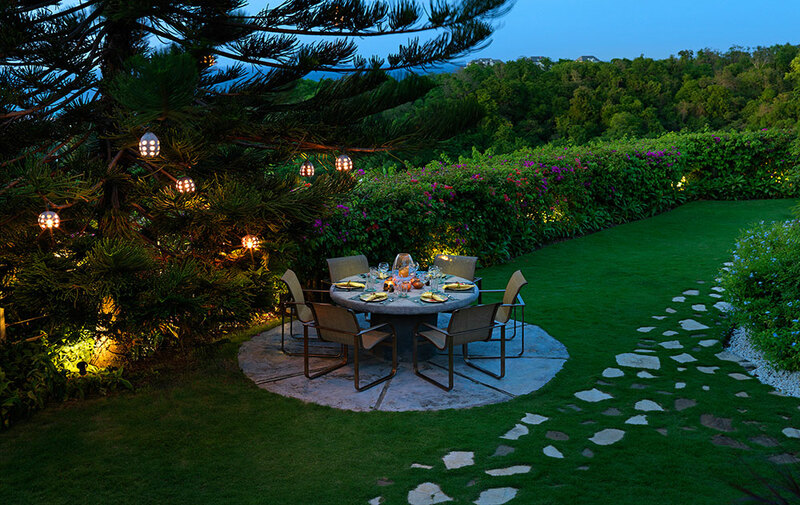 It has been built into the hillside, which gives guests privacy but also breathtaking views over the famous Half Moon golf fairways and the surrounding hills and expansive coastline. 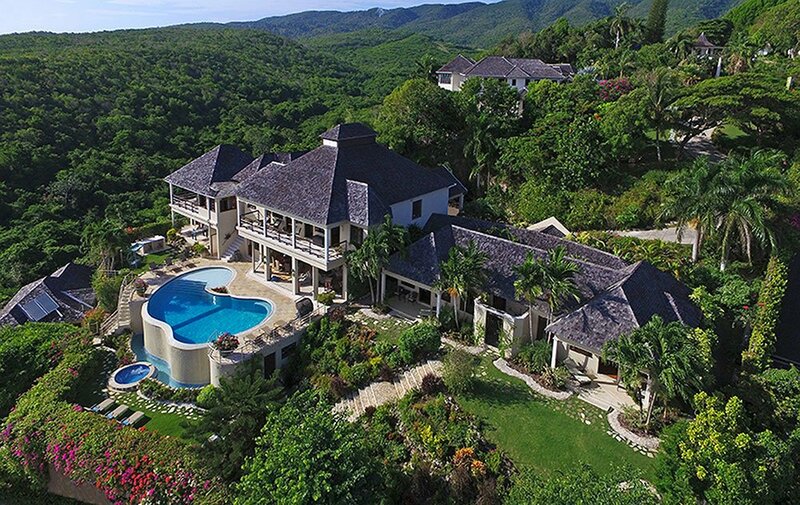 Greatview is only 12 minutes from the Montego Bay airport, the perfect location for golf enthusiasts as there are four challenging golf courses within easy striking distance. Greatview is also within easy reach of the Montego Bay hotels, tours, sightseeing, shopping, places of interest and excellent restaurants. The great-room is a combination living/dining-room with a 40-foot ceiling. 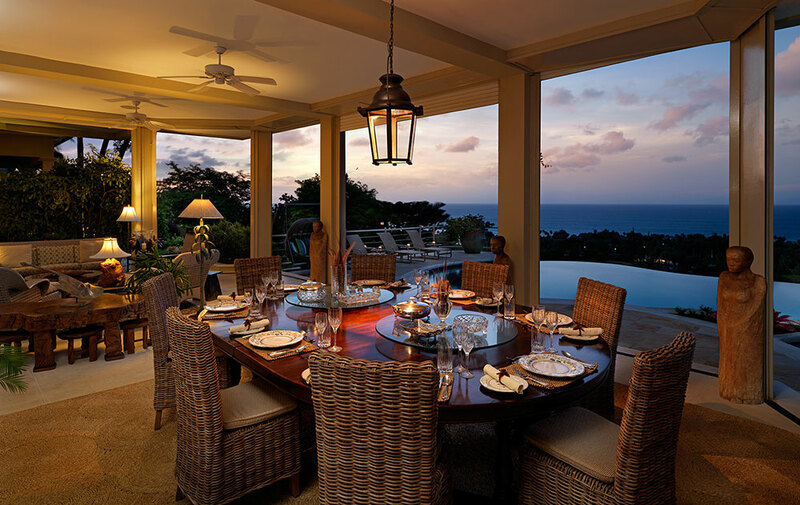 Huge glass doors can either open the room to cool ocean breezes or protect it from occasional inclement weather while preserving the view. 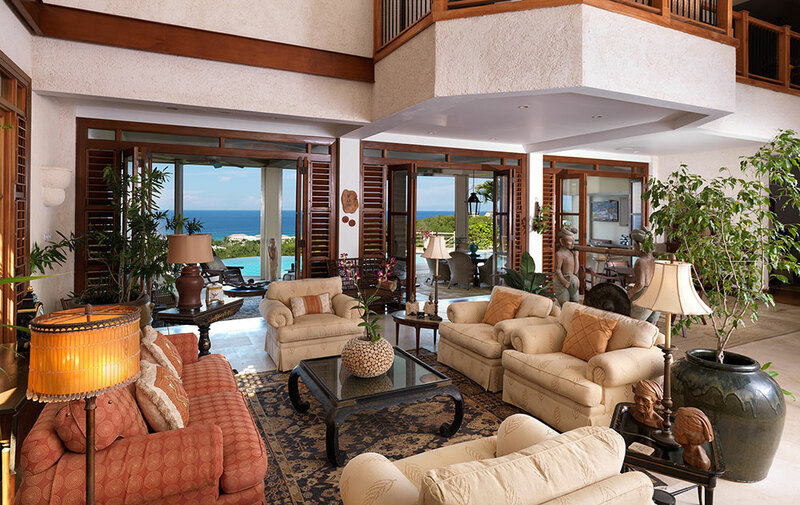 The great-room boasts comfortable sofas and lounge chairs with good light for reading. The mezzanine above has a smaller seating area for more intimate gatherings. Greatview has one of the most professional staff in our villa collection. 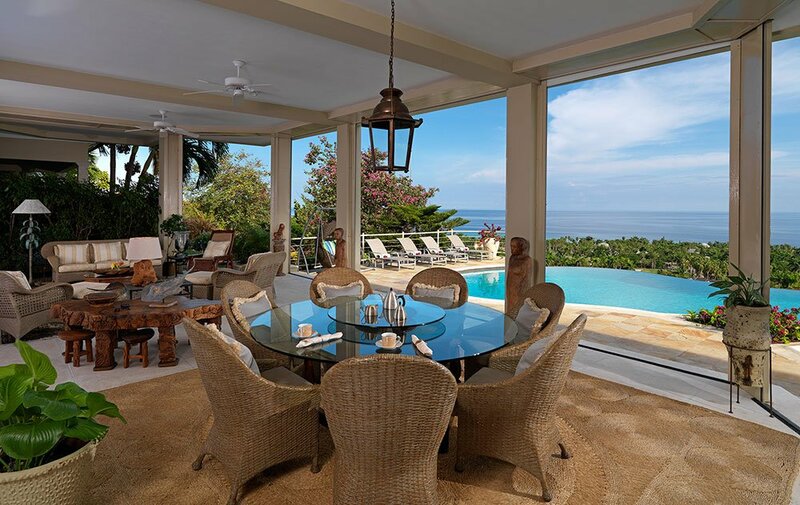 With hands on involvement and professionalism from this owner, Greatview is one of the villas with the highest standard of service in our group. A staff of 9 ensure the highest levels of service 24 hours a day. Our expert chef presents exquisite meals from the state-of-the-art kitchen with six-burner commercial gas stove and grill, two ovens, bread maker, rotisserie, microwave, wine cooler, ice maker and cappuccino/espresso machine. 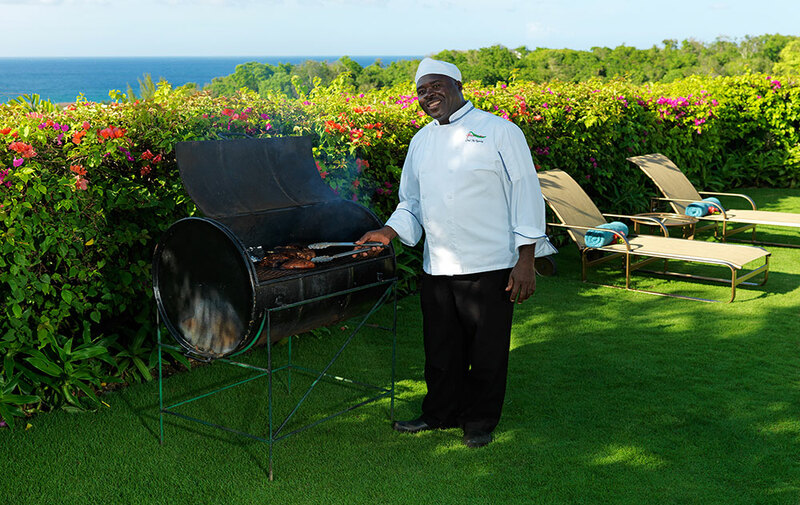 Chef Delores delights guests with her specialties of homemade pate, jerk chicken, lobster Newberg, grilled salmon in avocado sauce, pecan-crusted snapper, grilled shrimp and tenderloin, grasshopper pie and more. Table service is Wedgwood and Lenox china and sterling silver. 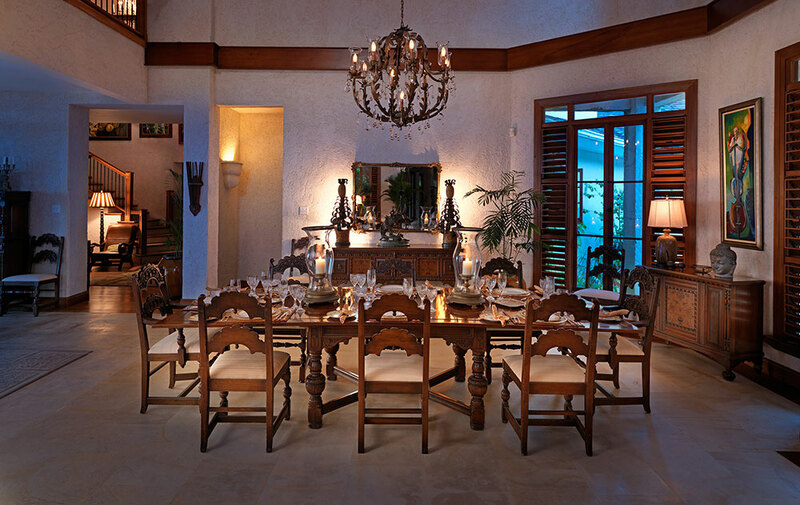 Meals are served formally under the crystal chandelier or more casually on the al fresco 700-square-foot verandah overlooking the pool and magnificent ocean view. Great villa for families, this luxurious villa is also quite child friendly. It offers complimentary cribs with mobiles, high chairs, playpen, baby toys and games, water toys, floats, water basketball and three tricycles. Greatview includes two connecting suites for families. Greatview is also perfect for guests who use wheelchairs or are physically challenged. 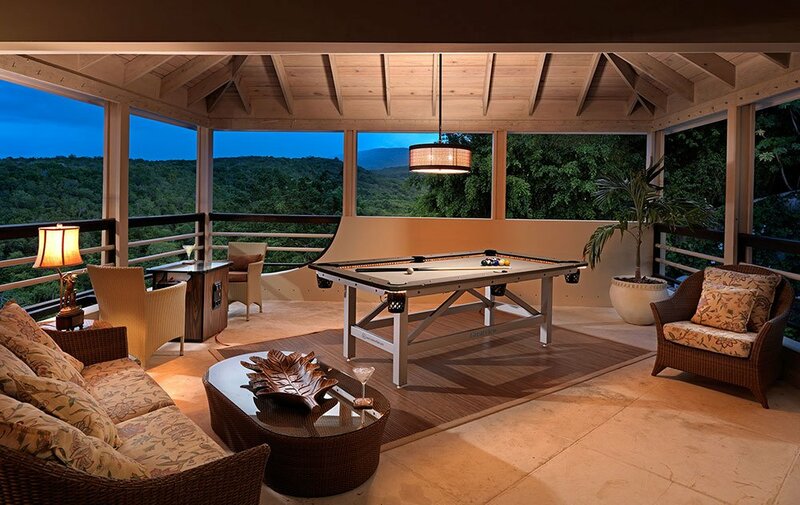 Added feature: Greatview has added a games room with pool table, foosball table and bar. 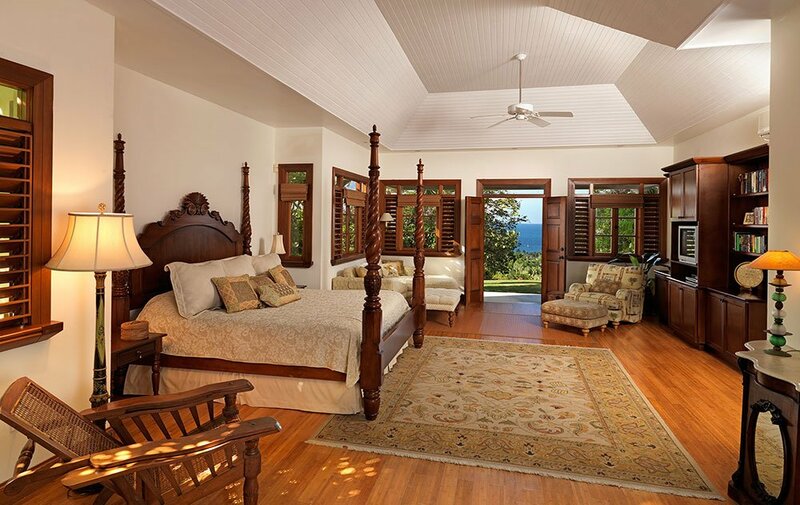 The Plantation Green Room: Master Bedroom Plantation Room on Main Floor 750 sq ft. Sit in the genuine plantation chair, or enjoy the view from your private patio. 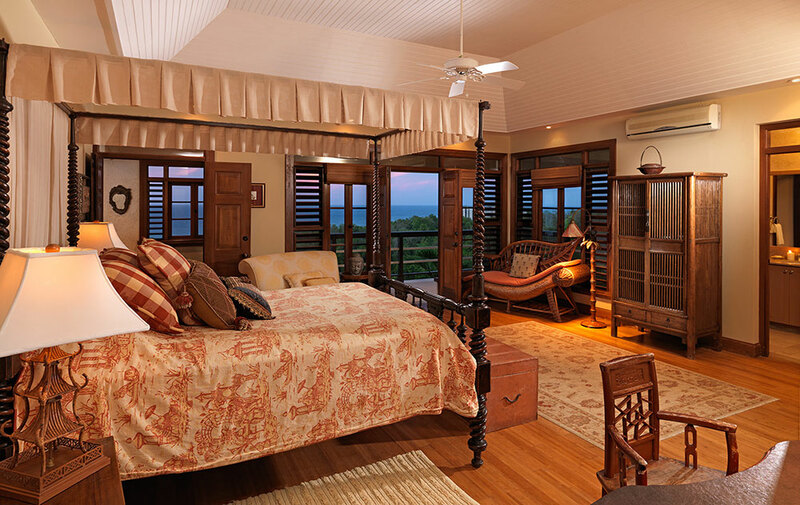 Dominated by the king-size four-poster plantation bed, this master suite has a comfortable indoor sitting area with a chaise longue and L-shaped sofa, a built-in entertainment unit and bar fridge. Its large bathroom features Jacuzzi tub, sitting area and dressing table. 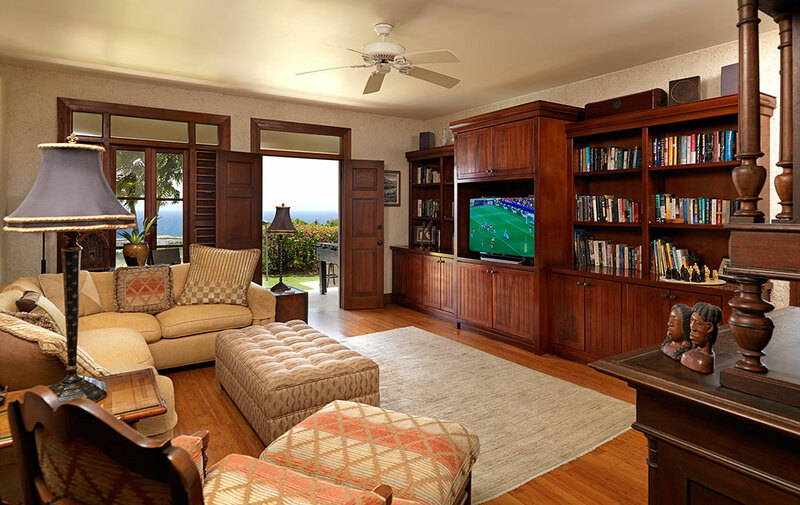 Visitors to the Plantation Green Room can choose between the sizeable indoor walk-in shower or a shower among the bougainvillea and flowering vines outside. Orchid Room on Main Floor 522 sq ft.
Two queensize beds. 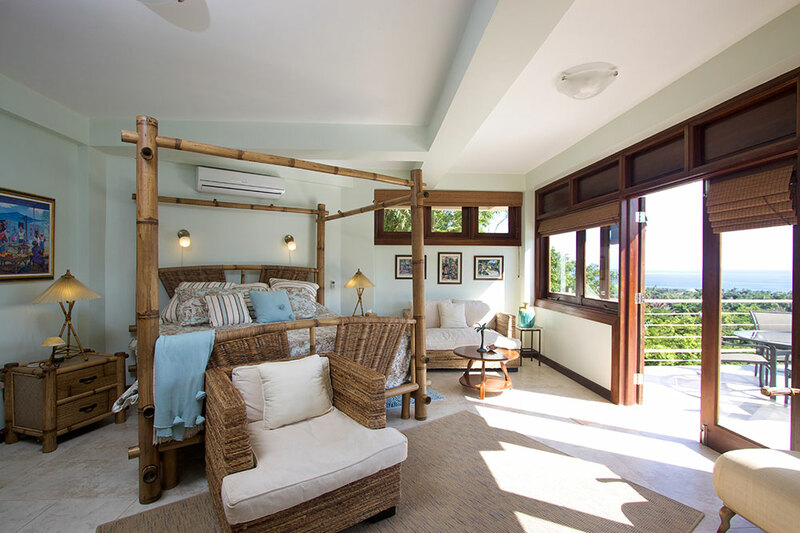 Connecting passage to Master Bedroom (Plantation Room).Also a large master suite, this room easily accommodates its two queen-size rattan beds. Treasured antiques in the room include a huge 19th-century walnut armoire and an English faux-bamboo desk. The large bathroom (Jacuzzi tub, sitting area and dressing table, walk-in shower) also features direct access to the spa and the outdoor Swedish and drench showers. The Orchid theme in the fine bed linens is reflected in the crystal vases full of colourful, fresh-cut local orchids. Named for its Burmese and Chinese furniture, this stylish room features a queen-size four-poster bed, red lacquered desk and antique Chinese wedding chair – a perfect backdrop to the owner’s collection of Asian art and small statuary. Step out onto the wraparound balcony and take in the magnificent views of sea and mountains from your lounge chair – or enjoy the view from the privacy of your deep-soaking bath. A second small patio retreat looks out over the mountains. Palm Room on Top Level up 9 steps 280 sq ft. Next to the Frog Room and a mirror image of it, this room carries the “palm” theme through the bedspread and pillows to the hand-painted armoire and dressers. It’s a cheerful green, red and yellow space, with king-size bed and balcony, ensuite bathroom with deep-soaking tub/shower combination. Frog Room on Top Level up 9 steps 280 sq ft. The name has stuck. The frogs are perfectly harmless – decorating the bedspread and pillows, serving as knobs on the dresser and bathroom cabinets, adorning the lamps. This room is cheerful, fun and full of bright greens, oranges and yellows. It features a king-size bed and a balcony, ensuite bathroom with deep-soaking tub/shower combination. Available only when all five bedrooms in Greatview are being used by the same family or group. 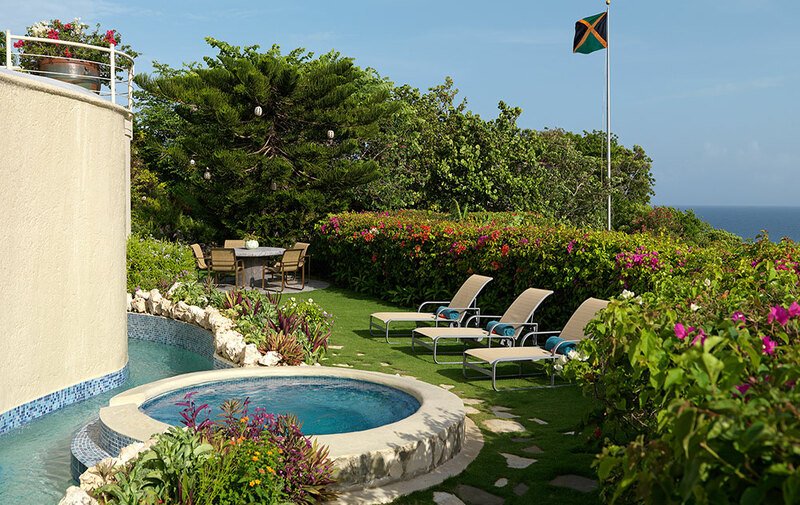 The Cottage is the epitome of Jamaica at its best. A riot of bright red, green, purple, yellow and blue, it’s casually and tastefully decorated with fine local wood furniture and crafts. The perfect accommodation for a couple looking for a romantic refuge (or for a family with small children who need their own space), the cottage is a secluded, self-contained unit just steps from the main house. The Cottage has one bedroom with queen sized bed, full bathroom with Jacuzzi tub, walk-in-closet and living room with a sofa that could sleep one child. For those who truly want seclusion, a small galley kitchen gives you the option of preparing simple meals and snacks for yourself. Gorgeous sea view from private balcony furnished with rocking chairs, chaises and al fresco dining area for eye-opener coffee, breakfasts or afternoon cocktails. Served by same staff as other five bedrooms in main house, including room service. Reached via 33 steps from the villa's main level or 14 steps from the lower lawn. Great privacy and gorgeous sea view. The Cottage is available for rent only when all five bedrooms in Greatview are being used by the same family or group. Greatview is on three levels. 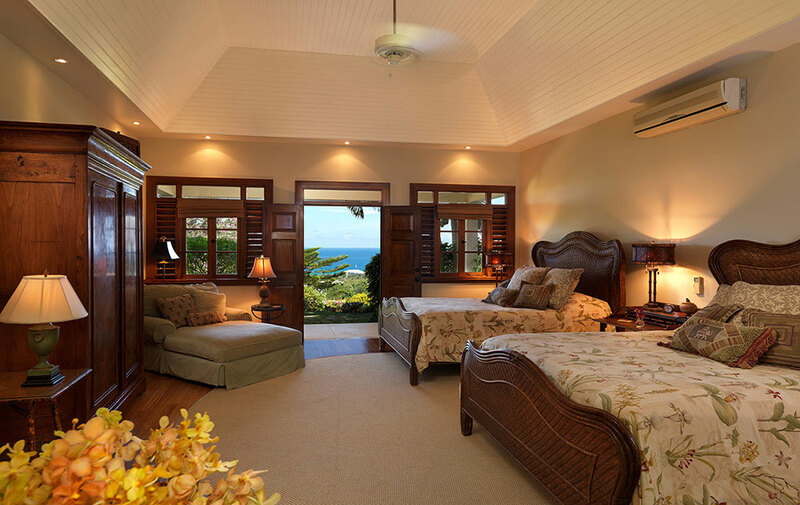 Bedrooms are exquisitely appointed and adjoin en-suite Travertine marble bathrooms. Smoking is not permitted in the bedrooms, but several open-air areas are available. All bathrooms offer hairdryers, shampoo, conditioner and glycerin soaps. 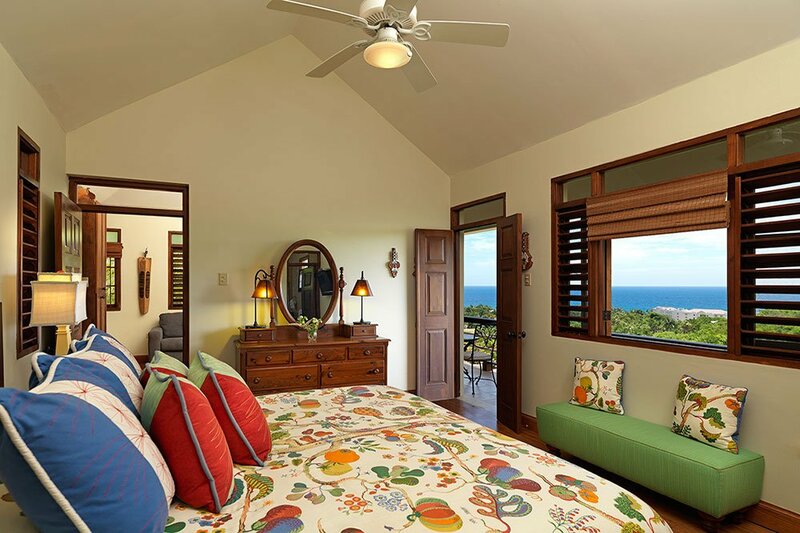 All bedrooms feature en-suite marble bathrooms with self-closing Italian Toto toilets, antiques, closet safes, remote control air conditioners, cable television and well-planned louvers for wonderful Jamaican tradewinds! Every fine vacation includes a certain amount of pampering. 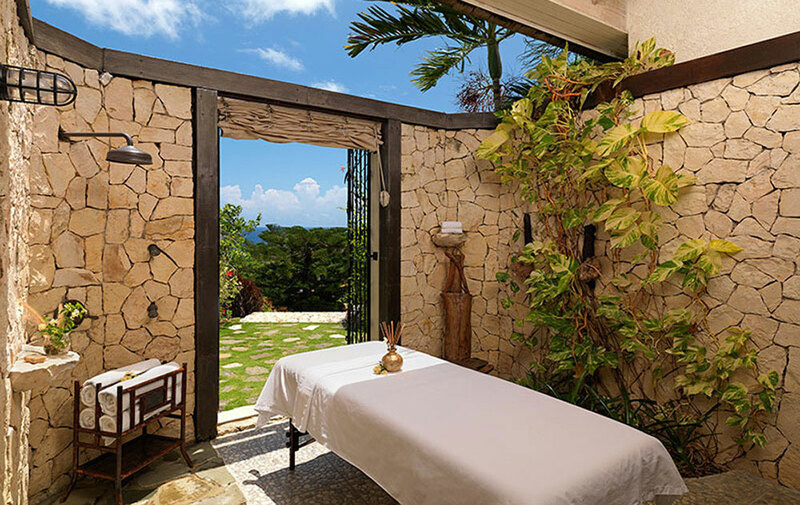 For those for whom “pampering” equals “spa,” Greatview offers on-call massage and beauty treatments in a lovely indoor/outdoor setting, equipped with Swedish and drench showers. A few steps take you to steam room, hot tub and pools. Exercise in air-conditioned comfort and enjoy the superb mountain view – or the satellite television. 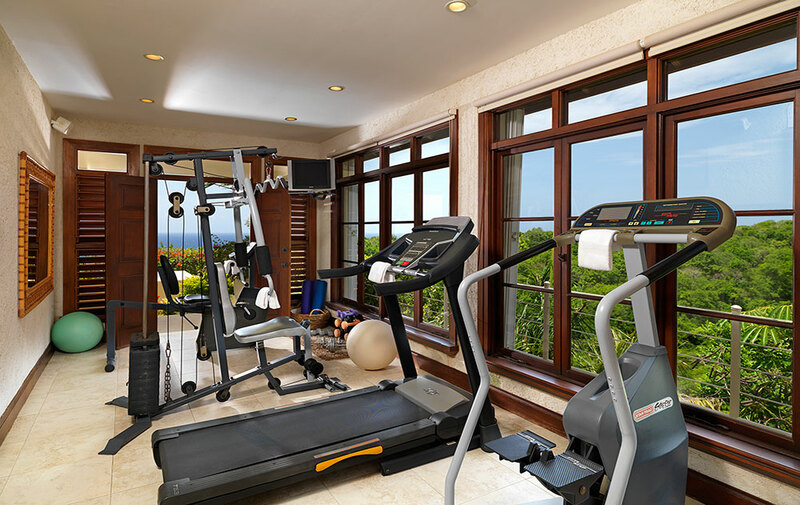 The room is equipped with treadmill, stairmaster, recumbent bicycle, mats and weights. Contemplate the sky and sea from a raft in the heated upper infinity pool (cool drink in hand optional). Splash with small children in the large shallow wading area or stand under the waterfall cascade in the lower pool. Or just lounge in comfort on the teak decks and watch the fun! The mainfloor rooms, covered pavillion and two master bedroom suites are wheelchair accessible and designed to accommodate the disabled. Complimentary nanny 3 hours daily for kids 12 years and under. Greatview's Kids Club is centered around Little View, a one bedroom treehouse/playhouse fully stocked with craft materials, games, puzzles and playhouse items. Under the tree house is a sand box and craft tables and play tents dot the surrounding garden. Depending on the children's age and interests, local craftspeople will be brought in for jewellery making, coconut hat weaving and other fun Jamaican crafts.
. children under 3, complimentary nanny service 3 hours a day, mornings or afternoon, applies to a max of 2 babies.
. children 3-12, Greatview Kids Camp, applies to a max of 4 children per session. 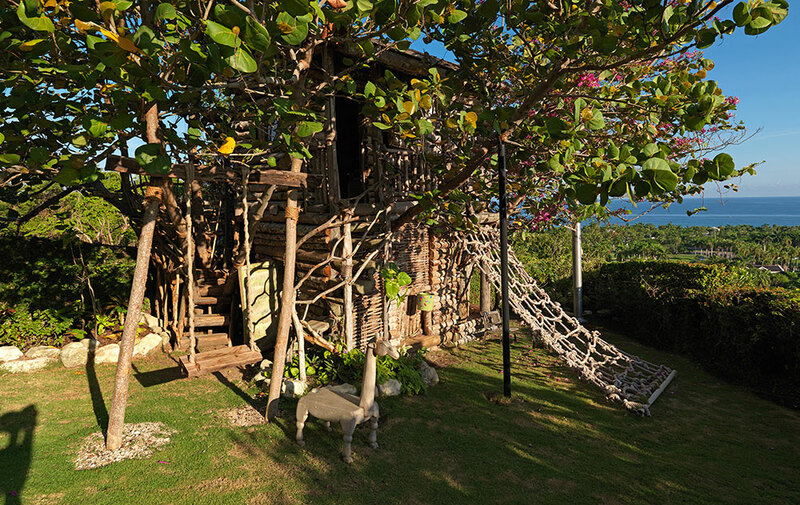 LITTLE VIEW - Kids tree house - Made with tender loving care! Great grassy area for kids, very safe and fun for all kids! Outdoor grassy area, climbing ropes up to the tree house, or take the steps! Kids Tree House bedroom, chalk board, toys, hand painted walls - crafted with love! Fantastic Tree House for kids, made with loving care! This is the only villa in our collection to have its own tree house and Kids Club on site! Complimentary nanny service for 3 hours daily , morning or afternoons, for kids 12 years and under. Greatview's Kids Club is centered around Little View, a one bedroom treehouse/playhouse fully stocked with craft materials, games, puzzles and playhouse items. Under the tree house is a sand box, and craft tables and play tents dot the surrounding garden. Depending on the children's age and interests, local craftspeople will be brought in for jewelry making, coconut hat weaving and other fun Jamaican crafts. Kids and parents may choose from a fun list of kids activities. 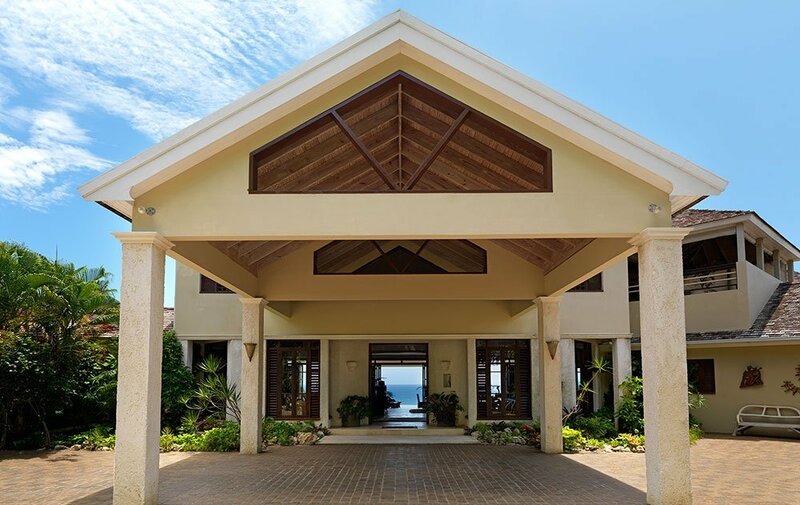 Also included but not limited to are wonderful activities such as face painting, cooking classes, Jamaican dance classes, treasure hunts, ping pong contests and much more! Nanny service offered for up to 2 babies less than 3 years of age. Kids Club offered for up to 4 kids 3-12 years of age. Resort Membership to Half Moon Resort for all guests staying at Greatview Villa.